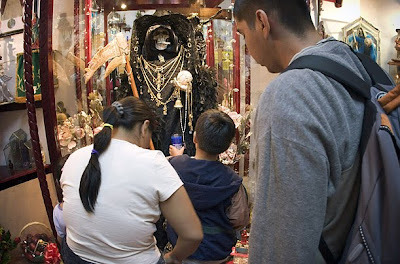 The devotion to Santa Muerte rattles many, even in Mexico. She is widely and purposefully misunderstood. The media focus on the lurid cult as a sign of the country's descent into new-millennial madness, a perfect partner for a danza macabra, played out against the backdrop of a modern plague -- the drug war -- and its obsessions with body counts and ritualized decapitation. The Catholic Church has rejected the cult, calling it demonic, and the Mexican military has swept across the border region, destroying roadside shrines built in the saint's honor. The authorities have condemned Santa Muerte as a "narco-saint," worshipped by drug traffickers, cartel assassins and dope slingers. But the worship is more a reflection of contemporary Mexico, says the anthropologist J. Katia Perdigón Castañeda, the author of "La Santa Muerte: Protector of Mankind." The cult is an urban pop amalgam, New Age meets heavy metal meets Virgin of Guadalupe. It is no accident that it is also cross-cultural -- that the centers of worship are the poor, proud heart of Mexico City and the violent frontier lands of Laredo, Juarez and Tijuana. The cult borrows equally from Hollywood and the Aztec underworld. Altars, necklaces and tattoos honoring Santa Muerte also make appearances in Mexican American neighborhoods from Los Angeles to Boston. "The believers may be drug dealers, doctors, carpenters, housewives. The cult accepts all. No matter the social status or age or sexual preference. Even transsexuals. Even criminals. That's very important, that the cult of Santa Muerte accepts everyone," Perdigón told me, "because death takes one and all." Where mainstream Mexican Catholicism promises a better life in the hereafter, "central to the devotion of Santa Muerte is the fact that the believers want a miracle, a favor, in the present, in this life, not when they are dead," Perdigón said. "They want help now." From a marketplace perspective, this is not a bad strategy to be a successful religion. It casts the widest possible net and promises immediate rewards. Read the full article here. But to get the real flavor, check out the photo gallery here. These photographs are fascinating. I loved number 14, where an aerosol is being used to spray holy water. So - is this a cult and/or is this part of New Religious Movements (NRMs)? 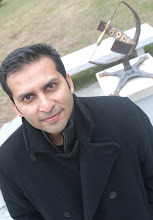 For a prior discussion on definitions, check out Cults, Sects and the Scientology Trial.